On Wednesday during normal trading hours, Citron Research released negative comments on hot stock NVIDIA Corp. ($NVDA) that sent shares cascading over 10% from highs at $119.93 to a close of $109.25. Citron Research, who is notorious for exposing companies flaws and placing big short positions, said that they believe NVDA is over valued and is set to lose market share in 2017. They placed a $90 price target on NVDA, which was about $30, or about 25%, lower than the prices it was at before the research notes were release. Citron Research claims that NVIDIA Corp. will experience “significant competition” in 2017 from other big companies like Intel Xeon Phi, AMD Radeon Pro and XLNX with AMD launching brand new graphic processing units (GPUs) in 2017 that are likely to take market share away from NVDA. It doesn’t mean that NVDA will not be profitable or experience growth in 2017, it just means that there will better greater competition and pressure in key market areas for NVDA, which may cause slower growth than expected. NVDA has been one of the best performing stocks of 2016. It started the year at $32.29 and as of the time of this writing, shares are trading at $104.81, marking a 225% return on investment! As you can see from the daily chart above, it has been in a strong up-trend the whole time with only a few dips below the 20-day moving average. Shares are well above their 200-day moving average that is currently sitting at $59.59 and their 50-day moving average that is at $87.02. There is a lot of support at $95 and $85, and if it can hold those levels we could see another pop back up. However, with negative comments out from such a big player in the markets, we could see some more selling pressure come in over the following weeks, which would actually be healthy for the chart given how much it has run up over the past few months. 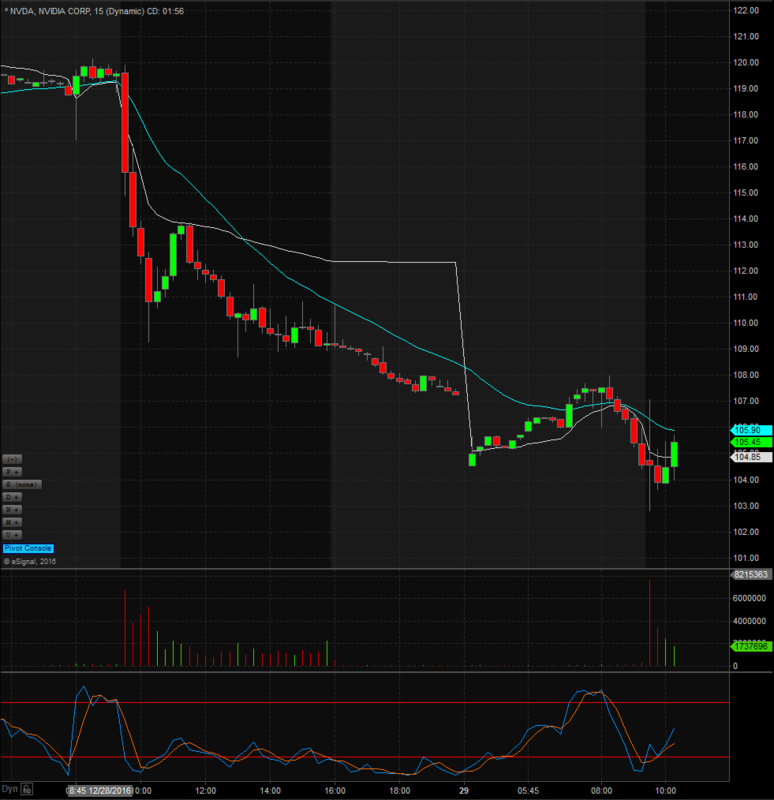 Above is an NVDA 15-minute chart for that last two days. We can see that shares had a big down down day following the Citron comments but what is really concerning from a technical stand point, is the huge bearish engulfing candlestick that printed on the daily chart. Bearish engulfing candles happen when prices open higher than the previous days high and then close lower than the previous days low, totally engulfing that candle. Generally after this type of candle, especially with the amount of selling volume we saw, we will see a reversal in price action from the original trend, which means we could see further downside in prices action. 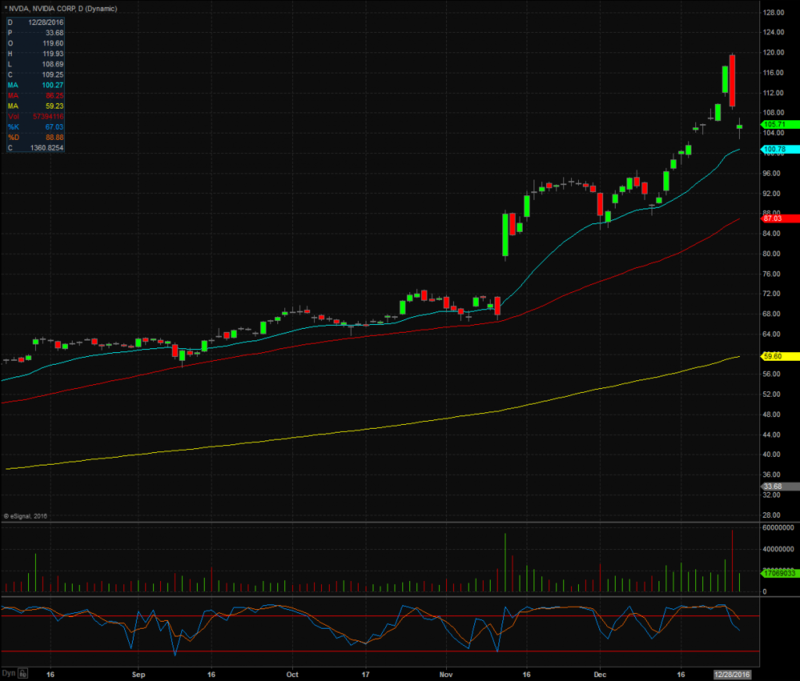 Looking at just the charts of NVDA, it has had a major run and has been overbought for much of the year. I would like to see prices cool off a bit and based off most of the price action for the year it has pulled back at most to the 50-day moving average and has bounced from there. Right now the 50-day moving average is at $87.10. If prices pull back to that level and hold it, then we could be back on track to continue the uptrend. However, if prices cannot hold that level then we could be in for further selling pressure and would be worth waiting to see what prices go before jumping in. Based on Citron’s research, prices are due for a pullback and even though it may be biased because they take short positions based on their research I tend to feel the same way based just on the technicals talked about above. Stocks can only go up so much before experiencing a pullback and NVDA is ready for one after this monster run up in 2016. If you’re long make sure to place hard stops and maybe look to hedge your position.